Libraries sign a wide variety of licensing agreements that specify terms of both access and use of a publisher’s electronic collections. Adding easily accessible licensing information to collections helps ensure that library users comply with these agreements. 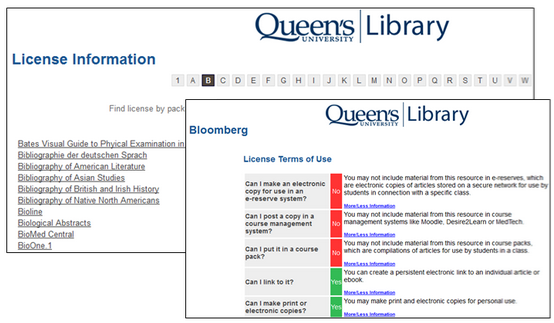 This article will describe the addition of licensing permissions to resource displays using Mondo  by Queen’s University and Scholars Portal (a service of the Ontario Council of University Libraries)  . We will give a brief introduction to Mondo and explain how we improved Mondo to add the license permissions to different library systems. The systems we used are an ILS (Voyager), an OpenURL Link Resolver (360 Link), and a Discovery System (Summon). However, libraries can use Mondo to add the license permissions to other library systems which allow user configurations. Possible outcomes of not complying with these agreements include loss of access to databases and legal action. As a result of the inaccessible nature of these licenses, and the serious consequences of having users ignore these terms, it is essential to make this licensing information accessible to all users in a format that is understandable and clear. This is why many institutions have created databases that make license permissions available to all. When I started working as the Information Systems Librarian at Queen’s University Library in 2013, my first project was to migrate the library’s OpenURL Link Resolver from SFX to 360 Link. A major task in this project involved linking the license permissions from the Mondo database to the e-resources in the user interface of 360 link. We finished the project in two months and here is a sample record of an e-resource in 360 Link and its license page. (Figure 1). Queen’s University Library uses Mondo, an open source application used to manage the copyright and license information for e-resources. Our Mondo is hosted by Scholars Portal, a service provider of Ontario Council of University Libraries (OCUL). (Figure 2). Because the license pages for our e-resources are created in Mondo, our task is to add the URLs of those license links to our library systems, for example, 360 Link. 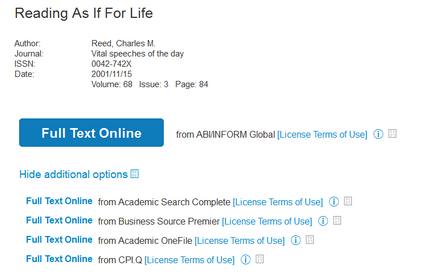 In SFX, this process is accomplished by inserting the license links into the “General note” field for an e-resource. Because of the migration away from SFX, we needed to build a new model for adding license links to our e-resources in 360 Link and other library systems. Michael Vandenburg, my supervisor, suggested using 360 Link Reset  and Summon_Click  to add the links to the user interface of these two systems. After discussing the priorities with my supervisor, my first step was to familiarize myself with Mondo, the open source software we use to manage the license permissions for Queen’s, as described in the next section. First, there were about 2,000 e-resources in our Serials Solutions’ knowledgebase and we needed to finish the migration from SFX to 360 Link in several weeks. Because 360 Link is a hosted service provided by Serials Solutions, we couldn’t batch load the license links for those 2,000 records into the database tables. During the summer, there were no student or library staff who could help us enter the data manually. In addition, we needed to add the links to the license information to other library systems, such as Voyager and Summon. Adding them in different library systems by myself would be very time-consuming. In order to finish this task by our deadline, we needed to find a new model for providing this service. Second, because the URLs of those license links are not in a predictable pattern (Sample records in table 1), we could not automatically generate the license links and add them in the target library systems. Finally, because we wanted to add the license links to our Discovery System (Summon) and there is no field that we could use to display that piece of data in Summon, we needed to work out a solution which could display the license links in different library systems using a predictable pattern rather than manually entering the links. We need to use a predictable, predefined pattern for the license URLs created in Mondo (For example, a base URL, plus the database name in a standard format), so that we can generate the license links with the same pattern in the target library system’s user interface. We need to be able to read the e-resource names from the target library system’s user interface in order to generate the URL (for example, in Figure 1, the e-resource name is “ABI/INFORM Global”). 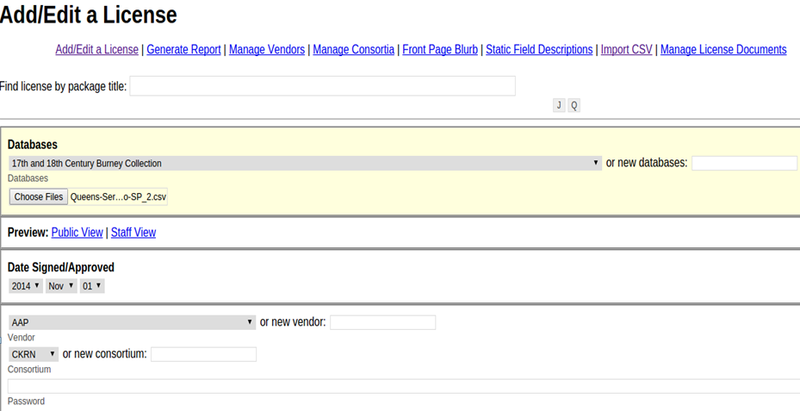 We need to create a “general license” page for the e-resources which do not have a license page in our Mondo database. First, we added a new function in Mondo to automatically generate the URLs for the license link pages in a predefined pattern “(rawurldecode($db_name))”. This allows us to generate the same pattern of the URLs in different target library systems’ interfaces, so that we do not need to enter the license link URLs manually in Mondo. //open the file in read mode. Notice the 'import' is the name of input in admin/licenselink.php. //the upload file needs to be csv format. databases: contains all databases. (columns could be db_id, db_name etc.). license_db: license – databases map (id, db_id, license_id). //To simplify the code, we don't add error check here. After changing Mondo functions and automatically generating the license links in a predefined pattern, we were ready to add the license links to different target systems. The examples in this article will be using 360 Link, Voyager OPAC, and Summon. Second, we defined the pattern for the URLs of the license links to:“http://baseURL+e-resourceName”, in order for us to add those URLs to 360 Link user interface. The baseURL is the http address our Mondo service provider gave us. For example: “https://queens.scholarsportal.info/licenses/license/?name=”. The “e-resourceName” is the name of the e-resource. Find the e-resource names in the 360 Link page (The e-resource names are given as the elements of a CSS class called “SS_DatabaseHyperLink”). Add the license links to the e-resource using the same pattern we defined in Mondo. (http://baseURL+e-resourceName). The code above simply goes through each link class (“.SS_DatabaseHyperLink”) and appends a license link to it with the URL Pattern (http://baseURL+e-resourceName) as we defined in Mondo. The name parameter is also read from the same link. After we added the license permissions to 360 Link in the summer of 2013, we discussed this process with our partners at Western University. We learned that they were able to add the license links to the OPAC of their ILS and Discovery System (Taufique, 2015), then we tried to add the license links of the e-resource to our Voyager OPAC. The XML above simply defines a baseURL variable and uses it in the newly added XML for the links. The provider name is extracted from the data in the Voyager OPAC interface and the license links are inserted in the XML file under subfield “z”. After we discussed this process with our partners at the University of Toronto, we learned that their team added the license information in Summon 1.0 using Summon API (Taufique, 2015). After testing in December 2013, it seems that the only way we can add the license links to Summon 1.0 is to use 360 Link API, because we don’t subscribe to the Summon API service. The data in the popup is loaded via AJAX. The AJAX call for each popup is made when the page loads all the search results. The AJAX call makes a request to the Server-Side Data Endpoint API, using an HTTP Request, which then returns a response with the entire popup HTML populated with the relevant data. Therefore, the interface must simply show that HTML to the user once the AJAX call has completed successfully. The search result list from Summon 1.0 needs to show the license information for each individual entry. Because the library decided to show the license links only for articles, we need to find the Journal Article entries in the Summon search result page first. The most easily deployable solution was to use client side functionality on the browser to dynamically add the links and respective popups for each search result. Since the search results are generated in a pattern it is easy to find that pattern and use it to make the modifications we need. We can see that each search result is wrapped in a “div” element with the class “.document”. Inside each of these “div” elements we have the necessary information to make our AJAX Request and obtain the relevant popup data to show the user when prompted. For the purposes of this section, the important part of this script starts at line 94 of the file from the github link above. After we get the ISSN and DOI data from the above code, we can send them to the php script to make the popup and display the article link, database link, holdings data, etc., in the mini-window shown in Figure 9. Make AJAX Call to Server-Side Endpoint API with the above parameters and add resulting popup code to the HTML DOM. When this code successfully executes, the user will be able to hover the license link and view the the license information for each of the e-resources within the popup. $url = $baseUrl.'? '.$queryString; //make the url of the query string combining the API key, baseURL, etc. We supply the DOI and ISSN parameters to the AJAX call which returns an XML result from which we can extract information about the article. We use fields such as “dateAvailable”, “databaseName”, and so on. It is important to note that we use the “databaseName” field as the key to retrieve relevant license information for a given article; this key will be used in the next step. For the purposes of this section, the important part of this script starts at line 212 of the file from the github link above. The above code is responsible for displaying the elements in a table in the popup window. We make a mini-version of the 360 Link search result page using 360 Link API and assign the license links to each of the e-resources. This way we provide the complete information for permitted use of the e-resource and it’s easy for the users to understand because it’s similar to the 360 Link user interface. Modifying Summon 2.0 to achieve similar functionality for license links was easier because we found a script called “dnl_summon_custom_step3.js”  from the articles “Hacking Summon 2.0 The Elegant Way” in the Code4Lib journal (Bailey, 2014) and “Exposing Library Services with AngularJS” (Voß, 2014). All of them helped us customize the Summon 2.0 user interface. Although all the techniques described in the Code4Lib article “Hacking Summon 2.0 The Elegant Way” are good and have their own merits, we decided to use “Technique 2: Direct DOM Manipulation” because it was closely related to the same methodology as the techniques we used to modify Summon 1.0. For the purposes of this section, the important part of this script starts at line 217 of the file from the github file listed above. Our approach to modify Summon 2.0 was to identify the HTML Structure that was used to store the relevant source name data and then to create links that directly send the user to the license information. Compared to Summon 1.0, Summon 2.0 was easy because it uses AngularJS, a standard MVC client-side framework that is documented and can easily be understood by a programmer. We decided to inject our code into a “watchCollection” observer, which is a facility provided by AngularJS to detect changes made to a collection of data such as our search results, because we wanted to generate the links every time the list of search results or “feeds” were changed. So for example if we wanted to get information regarding Source: “ACM Digital Library” we would enter the following URL into the browser: http://baseURL/licenselink.php?name=ACM Digital Library. We can see the feed change event handler above; this handler basically waits for search or feed changes and runs our link generation code when such changes are detected. After we learned about the Summon 2.0 user interface, we found that the e-resource is called “Source” in the detailed record popup on the right side of the screen. The next step for us was to get the data in this field and assign the license links for those e-resources. (Figure 12). 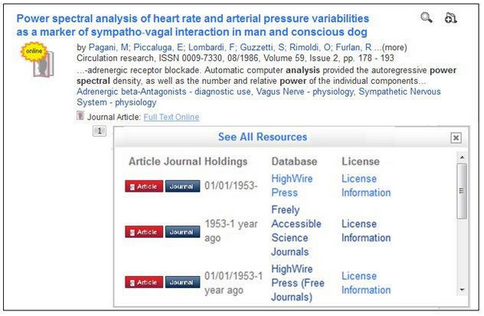 The source names (“[ABI/INFORM Global]” and “[Academic OneFile]”in Figure 12) we need are visible in the popup on the right and it appears when we mouse over the record listed in the search result. If we observe the figure above, we can see that the popup has information regarding the first record in the search results, which is where the user has “mouse-over”. In this application we do not need to embed the links into the HTML. When the user clicks the “empty” license link, we dynamically build the appropriate URL for those links and redirect the user to it when the user clicks any of the generated links. First, we find all the <li> items shown in Figure 11 by using JQuery to select them; then we simply check if the text “Journal Article” is in the selected HTML, since we are only handling journal articles. If the item is an article, then we inject the “empty” “Source: [License Information]” links. Generate the URL based on the extracted data and redirect the user to it. The source names are stored in the “myscope.preview.doc.databases” array. If any source names were found, we generate the relevant links for the user to click. If the source was not found for any reason then we redirect the user to a general license page (“http://library.queensu.ca/360 Link/360sample.htm“), which informs the user to contact the Copyright office for license information of that e-resource. When the “empty” license link is clicked we check that source data is available by checking the “myscope.preview.doc.databases” array existence and length. If such array is available and has at least one source then we proceed to insert the HTML code to create the links for the user to click if needed. 360 Link is a hosted service provided by Serials Solutions. We could not load data into 360 Link’s database, which means we could only enter data manually from the vendor’s client site. This made it difficult for us to modify the records efficiently. In addition, there is no testing environment in 360 Link and Summon. In Voyager, we have a sandbox folder in which we can test our code, but in 360 Link and Summon we need to set up those testing environments ourselves. We also need to wait at least 24 hours to see the changes we made in 360 Link and Summon, which means if we made a mistake in the configuration, the interface will be displayed with this mistake for 24 hours. The biggest challenge for adding the license links in the Voyager OPAC is that we didn’t find much documentation in the Voyager manual about customizing the OPAC skin. Through a Google search, we found a number of useful presentation and documents made by other Voyager users on how to do similar tasks, which helped us to understand and modify the configuration files in Voyager. One key reason we were able to finish this project is the community support we got from the users groups. For example, the Summon-clicks.js for Summon 1.0 and dnl_summon_custom_step3.js for Summon 2.0 and the articles from the Code4Lib Journal had already solved several issues we faced. We built our solutions using those scripts and they saved us a lot of time to finish the project on time. Because our service provider Scholars Portal hosted Mondo for us, we could not edit the license page URLs in the database table, or load all of the URLs into Mondo. We needed to work closely with Scholars Portal to modify the data in our Mondo. Fortunately, Scholars Portal helped us whenever we needed their support. We also learned a lot from other libraries in the OCUL consortia, such as Western University and University of Toronto. They provided us with solutions for adding the license links in the systems that they use, and they shared their experiences with us. This is another key reason why we could successfully finish this project by the deadline. From the summer of 2013 to Spring 2014, we worked with Scholar Portals and added the license links to the 360 Link and Voyager in production, as well as the Summon 1.0 testing site. Because Summon 2.0 uses AngularJS, which was new to us, and we did not have a plan for migrating our discovery system from Summon 1.0 to Summon 2.0 by the Summer of 2015, we waited to add the license link to Summon 2.0 after reading articles posted on Code4Lib and consulting with Ahmedullah Sharifi, an expert in AngularJS. Interpreting, managing and providing licence terms to library users is a complex task. Integrating the information in the Mondo database into tools like Summon and 360 Link allow users to access this information at their point of need, which helps libraries meet their legal requirements while making it easy for users to find this information. With access to this information, users may even discover that they can use items in ways that they didn’t realize were possible, for example, as a pdf upload on a learning management system course page or in a print course package of readings. Throughout this project, we needed to work with different vendors, user communities and our partner Scholars Portal to find solutions for our needs. This is not a project accomplished by our group, but a project supported by the library community. We hope this article can help other libraries provide user right/license information to their e-resources and avoid the issues/problems we had during our implementation. All of the scripts/codes described in this article are avaliable at the following URL: https://gist.github.com/happyrainb. Libraries have started using more vendor hosted services than before. These vendor-hosted services make customizing library systems more difficult, especially when the vendors release new versions of their systems and change the user interface, system configuration, etc. We have to deal with different types of issues and be creative in solving them. In addition, we need to work with peers in consortial universities, members in the same user group and vendor support teams to find the solutions to our unique needs. Making license information accessible at points of need for users drives future integration possibilities for Mondo. For example, information from Mondo can be included in proprietary databases or in university libraries’ Digital Asset Management tool or Institutional Repositories. By including the copyrights/access rights information like this in a Digital Asset Management System (in the Digital Preservation Process ) or in an Institutional Repository (In the submission process), libraries can showcase the flexibility of these resources for users as most of this material is open access and can be used for all of the purposes generally included in Mondo. This can help encourage the open access movement, while also increasing the use of library provided tools. The following people helped us with this project. Without their support we wouldn’t have been able to add the license links to our systems. We gratefully acknowledge their assistance. Our partners: Amaz Taufique, Assistant Director of Systems and Technical Operations; Marc Lalonde, Web Coordinator, Librarian, University of Toronto; Christina Zoricic, Acting Head, Metadata Access, Western University. Our Project team: Michael Vandenburg, Associate University Librarian; Mark Swartz, Copyright Specialist; Anne Brule & Ellen Symons, E-Resource Librarian; Katie Legere, Web Coordinator; Andrew DaCosta, Web Development Technician; Alex Fletcher, Application Support Technician. Scholars Portal is a service provider of Ontario Council of University Libraries (OCUL). It hosts the e-resource license database using Mondo for Queen’s University Library, as well as the other OCUL members’ license databases. Mark Swartz is the Copyright Specialist at Queen’s University. In this position, he works with librarians, staff, faculty and instructors across all faculties and schools to develop web-based information and educational programs on copyright. Mark has held two other positions at Queen’s – as an education librarian and as the online course developer for the Continuing Teacher Education Department.